Super Hero Boy: What are you seeking? I had honestly never heard of the Legend of the Seeker before it came out as the entire first season on dvd. I'm not honestly sure how I totally missed it but then again I'm not a huge TV watcher in the first place unless something in particular I want to watch is on tv. Legend of the Seeker was one of those series that so often I happen across in my dvd reviews that really surprised me. I sat down and watched the entire season in a two day stretch, a rare feat for me to watch so many hours at once and I have to say I'm really impressed. When I first picked up the series I knew I'd enjoy it though I had expected another run of the mill middle ages type fantasy with dragons and wizards and all the such. In that I would have watched it regardless as I'm totally a sucker for that type of show, however, this wasn't exactly the run of the mill story line. In Legend of the Seeker the "seeker" is basically the hero of the story for told to be the end of the evil Darken Rahl, except that there are these massive magical barriers separating the kingdoms. With the help of a wizard and a confessor, basically a woman who has the ability to control people's minds, he sets off to fulfill his destiny and help people along the way. It all sounds a bit confusing and the storyline is complex but not so complex that you couldn't understand what was going on after watching a few episodes. Though there is a bit of sexual tension in the series for the most part its family friendly as well (rated TV14). Though produced by the same group that made Xena and Hercules the show has the same sort of feel, this was a fact that I never knew about until after I finished watching the show though I sort of suspected, but without the goofy humor. It does share some of the same lightweight fantasy appeal that speaks to a much wider crowd than just die hard fantasy geeks. The series was also adapted from a book series called the Sword of Truth, I honestly cannot tell you how it compares as its not one I've read. However there is a large amount of bonus features dedicated to the author of the book and his views on the show. 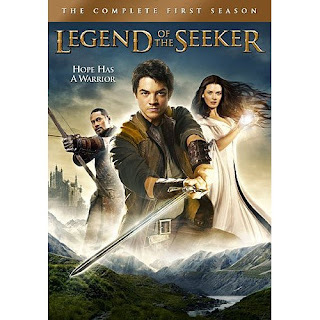 You can check out The Legend of The Seeker - The Complete First Season right now and pick up your own copy on Amazon! I highly recommend it.